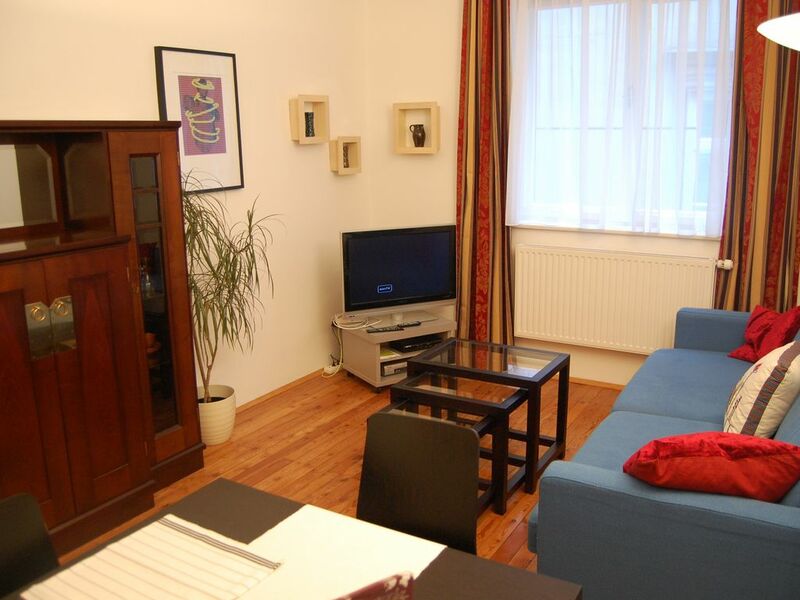 The apartment is located in the middle of the Viennese inner city, only a 2 minute walk to Stephansplatz, opera, Hofburg, Albertina, the Spanish riding school. You have a cosy 3-room apartment in the best location, for 2 to 5 people. The building is part of the famous Palais Palfi on a peaceful side street, between Hofburg and Graben, in the middle of the historical centre of Vienna. In the 1st district, the ideal starting point for your city tours! The pedestrian zone of the inner city, the famous Kärtnerstraße and the graves with their large selection of restaurants, cafes and shops are in front of the house door. The environment invites you to combine culinary and cultural delicacies. Spend your stay in a 60 m2 high quality and fully-equipped three-room apartment, on the 1st floor with a lift, cosy and full of charm, absolutely peaceful on a side street located on an inner courtyard. Completely renovated in 2005 and newly furnished. Look at our HOMEPAGE www.austria-france.com/wien. Arrival / infrastructure: By subway or bus, the apartment is 10 minutes from the west train station, from the airport with the direct train and subway 30 minutes. The airport shuttle bus brings you comfortably from the airport to Ringstrasse. Bus / subway (subway station Stephansplatz) / tramway and taxi stand are nearby and will bring you to all attractions in the inner city like the Schönbrunn castle, 'Hundred Water House', the world famous Prater with carousel, to Grinzing with its famous wines, the 'Heurigen'. Parking options and garages nearby. A car is not necessary. Shopping and groceries: The unforgettable selection in the Viennese inner city with restaurants, 'Beisln' and the famous coffee houses are available for you. Bakery and shopping market can be reached easily on foot; only a few steps and you will find a large selection of fashion stores, antique handlers, art galleries and museums, ticket offices for your theater, concert and opera visits. Relaxation / museums: Relaxation options are offered in the bordering castle garden and the Volksgarten. Museums nearby: Albertina, museums quarter, art and natural history museum; countless galleries. In our French - Austrian family we rent our summer house as well with a swimming pool on the Atlantic island of Oleron (with a car bridge on the mainland) # 49408 and the inner city apartment in Paris, only a few steps from the Champs Elysées (# 514829). Beautiful and light bathroom with a bathtub and shower options, toilet and window; hair dryer. On the 1st floor with a lift. Separate, fully equipped kitchen with window. Electric/gas stove, oven, microwave, fridge, freezer, coffee machine, toaster, water cooker. Cosy wood parquet floors in all rooms; tastefully furnished with all comforts. TV with cable, hifi system, DVD, internet connection; gas heating. Enough storage space available. Board games, books, ironing board, iron, vacuum. You can arrive by car. Parking nearby. Arrival and departure flexible on all days of the week. This 2-bedroom flat worked great for our family of 4 adults. The location was great - so close to many tourist sights, subway, restaurants, grocery store and Stephansplatz. The flat was well appointed and clean. The hosts were quick to respond and were helpful. There was some street noise and a church whose bells rang regularly. These might bother light sleepers. The flat itself was quiet. Felt safe in this neighborhood. We loved our stay in this apartment! It was right in the middle of everything, allowing us to easily walk around the city center. The beds were comfortable and the kitchen and bathroom had everything we needed. A grocery store was just a block or two away. The UBahn was also very close, making it easy for us to travel to and from the train station and Schönbrunn Palace. We had a great stay here! We loved the location, the size, was super clean and very “Austrian” feeling. It was well equipped with everything one would need. Would recommend anyone to stay here. Very central location. This apartment’s location is perfect, close to everything in central Vienna, a fabulous restaurant and a charming café down the street. The apartment itself is clean, functional and well maintained. The beds were comfortable, the modern wet room was great, there were plenty of towels and basic household supplies, and the Wi-fi was good. It was really hot when we visited Vienna (33C) so we slept with all the windows open without having to worry about outside noise, as the street is very quiet. It was absolutely lovely waking up to the sound of church bells in the morning! I will definitely try to stay here again whenever I visit Vienna. I was so please with this rental. It was so lovely... perfect for family of 4 or 5. The apartment is clean and well appointed. The location is amazing. It is centrally located. You can walk to everything. You don’t need to take a cab here from airport , use the CAT to Wien Mitte and take the 3 line to Stephenplatz... use the elevator to street level and you will be less than 100 yards from street that the apartment is located on! This rental made our Vienna experience so pleasant we plan to return next year. The ideal location for your city holiday! In the middle of Vienna, you can go on a walk past the graves, visit the famous café Hawelka, which is located on the same street. Your morning jogging can be done in one of the most beautiful parks in Vienna, the castle garden or the city park. For lovers of classical music, there is the opear and concert halls, for example, the famous golden court of the music community, can be reached comfortably on foot. After a museum visit, like to the new museum quarters (including the Leopold collection) or the art history or natural history museum, the Albertina, you can walk back over the Heldenplatz to your 'Viennese house', make a stop in one of the typical Viennese coffee houses. The Ringstraße with the historical attractions like the Hofburg, opera, burg theater, stock, Albertina, town hall with a lot of museums and gardens, like the burg garden, Volksgarten, city park, etc. can be reached in 3 minutes. Bakery and supermarket nearby. Die Mietpreise sind abhängig von der Anzahl der Personen: Möglich für 2, 3, 4 oder 5 Personen. Die angegeben Preise beziehen sich auf die Belegung für 2 Personen pro Woche.